There are traditions with Easter but not as many as Christmas. There are Easter foods as there are Christmas foods but most of the food centers on Good Friday on culminating with Easter Dinner on Sunday. One of the Easter foods are cookies. My mother made cookies for my brother and I for Easter. Cutout cookies, frosted and decorated. It's a tradition I did for Daughter Sarah. And a tradition that I still like to do. But not just decorated cookies but painted cookies. Little Easter bunnies with pink ears and noses and a black tail and whiskers. Perfect little bunny cookies. And chicks -- the royal icing colored yellow and then the details painted on. The idea came from Monique, La Table De Nana. Hers are far nicer and more detailed than mine but I find these darling. Two of each tied in a celophane bag with a purple ribbon. Ready to be delivered to friends and family. And once the cookies are done, it's time to dye the eggs . . . I do as my mother does . . . . tea cups filled with boiling water, a teaspoon of vinegar and food coloring. My French egg holder is the perfect drying rack, and when the eggs are all done . . . 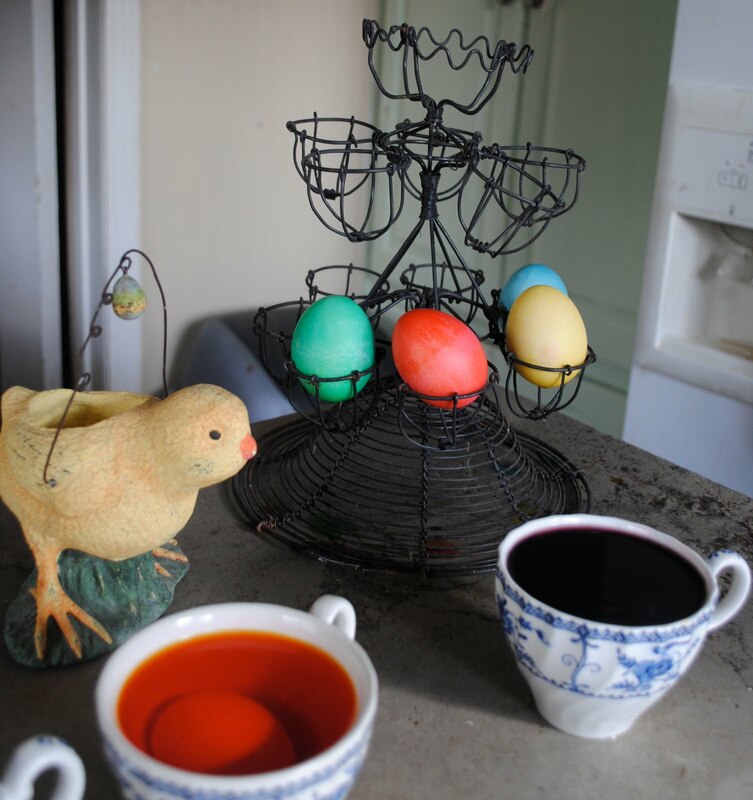 It's the perfect rack to display the eggs on the breakfast room table. Another tradition . . . for these are the eggs that eons ago, the bunnies used to hide on Easter eve. Come Easter morning, with a basket in tow, we'd go out to find the eggs hidden by the Easter Bunny. Silly Rabbit -- he traded chocolate for eggs but as he hopped away, the eggs would fall out . . . he'd have no eggs so he'd have to go to another house to leave more chocolate and get more eggs which he'd drop as he hopped away . . . . It's Saturday and besides Pink, it's Easter Yellow. And the chicks (or my "peeps" as I called them) are definitely yellow. As are some of the eggs. And the old chick, which I rescued from basement storage today when I brought up the egg rack. He seemed lonesome. Please join Beverly at How Sweet the Sound to see the pinks of this Saturday! Your cookies are just beautiful. Decorating sugar cookies and coloring eggs are traditions in my home too. Love your little chick cookies, Martha. Easter wishes and blessings to you and your family. I love the chicks! Monique has the technique down but my attempts have been far from perfect. Martha, those cookies are absolutely adorable! I love the idea of the cellophane wrapping and I'll be heading for the craft store to buy some tomorrow. Early this week I bought an old (antique?) rabbit cookie cutter and intend to take painted cookies to my sister's for each of the dinner guests. We'll all have eggs too, and indulge in an old family tradition of tapping the eggs end to end to see who has the winning egg. 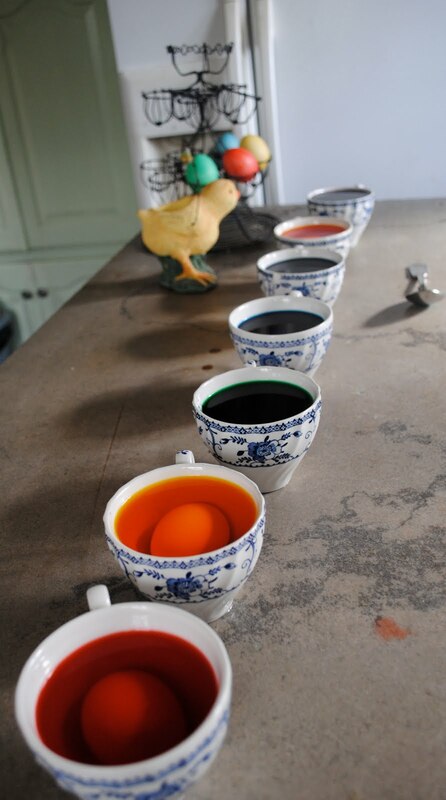 We color eggs the same way (that shot was great!). Sadly, I grew up in a Paas household but learned the better way of dying eggs on an episode of As The World Turns! Jack and I will be making Easter cupcakes today. He loves to help. I love the egg-tree! What a treasure. And your cookies are just gorgeous. Blessed Resurrection Day to you my new friend. Oh I love your cookies...those chicks are so sweet! How cute is that Easter egg dye! The egg tree is special, and I love the old chick! Happy Easter! Martha, your post takes me back to my childhood. I love the old chick! Yes, the egg colors are really bright and pretty. The French egg stand is perfect. You are so artistic with your cookies. I thought I was doing well to make a platter of deviled eggs and to get out my bunny rabbit plate, put green Easter grass on it, and arrange chocolate truffle eggs on it-- so now will enjoy your beautiful Easter decorations vicariously. You have such good taste. Happy Easter! Lovely post! I Love the cookies. May you have a blessed Easter. A blessed Easter to you and to your family. adorable post as always. Love your treasures and love your egg dying process. Happy Easter! I love the cookies and dyed eggs! I love your french egg holder! I'll be on the look out for one of those. Your eggs are so pretty and usually I color my eggs the same way. This year I boiled them with onion peels...just like my grandmother used to. Happy Easter! Lovely post. Yummy cookies.Happy Easter to you and Happy Pink Saturday too. I'm having a giveaway, please feel free to drop by and join in. Happy Easter to you and your family. Have a great weekend. Your Easter traditions look like so much fun! I used to love coloring eggs , decorating and making cookies at Eastertime, but have gotten away from it as the years go by. You and fellow bloggers have inspired me to try and get back some of the holiday magic! I love the picture of the teacups all in a row. What a great shot to capture a good memory. =) I'm glad I found you - I'll be back and thanks for the visit! Your blog is wonderful! I must come back! Those cookies are great -- terrific icing work!